Den Hartog Industries’ VERSAFLOAT line of Blow-Molded Float Drums are designed to provide a safe and durable means for the support of floating dock systems and features 8 mounting slots for attachment. The top and bottom of the float are ribbed for strength and the sidewalls are ribbed at each connection point for strength. 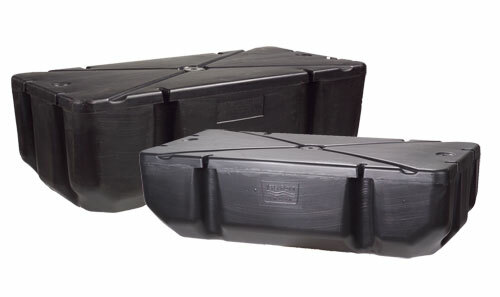 Den Hartog Industries stands behind the VERSAFLOAT float drums with a 15-year warranty (10-year full and 5-year prorated). This Blow-Molded material is even more puncture-resistant than the Rotationally Molded shells. The foam fill is expanded polystyrene (EPS) and is CFC free. These floats have been tested in accordance with industry standards and meet Coast Guard specifications. Ace offers a 15-Year Float Drum Warranty on all of its manufactured float drums to the original owner. If you are interested in ordering high-quality commercial float drums from Den Hartog Industries, Inc., please contact the distributor for your area. View the PDF version of our Procedures for Using Ace Float Drums for information on storage, vent plug insertion, frame support, attachment methods, and installation & removal of docks with Ace Float Drums. You can also view our complete line of Rotationally-Molded Ace Roto-Mold Float Drums. Need A Quote? Have A Question? Ask Advanced Tank today!